Hands down my baked ziti recipe is one of my most searched for freezer meals over at Tip Garden. So I am sharing it here too. This is a crowd pleaser both in taste and quantity! Pasta is inexpensive and a great way to feed a crowd on the cheap, which makes it perfect for upcoming reunions, weddings, graduations, or any large gathering. It makes 2 of those large (1/2 sized) steamer pans that are sold in bulk at party stores and warehouse clubs. (pick the ones that are 4 inches deep not 2 inches!) so total pan dimensions if your not sure are approx. 12x20x4 inches. Each steamer pan should serve 15-20 main dish or more if it's a side dish. So the total recipe should serve 30-40 people for a dinner. It can be made ahead of time and stored in the freezer! Just pull out to thaw the day before you need it! Spend your day before the big event worrying about other things, not the main dish! Because the pasta is precooked, on the big day you are really only heating it through and making it melty and warm, great for working with tempermental rental ovens at churches or venues. Sometimes they don't really work as well with large quantities of food being cooked, so no worries that your main dish is not cooked properly! People can even bring it pre-baked and put in the oven on warm to hold till serving! Just add a tossed salad and some rolls, for an easy,yummy dinner! Cook pasta as package directs, drain and set aside. In very large mixing bowl, stir together, cottage (or ricotta) cheese, parmesan cheese, and beaten eggs. Stir in 1/2 the cheese and then all of the pasta, tossing gently to coat. Divide the pasta/sauce mixture evenly between the two 1/2 steamer pans. Pour the remaining 1/2 of the spaghetti sauce evenly over the ziti mixture. Sprinkle remaining mozzarella cheese on top. 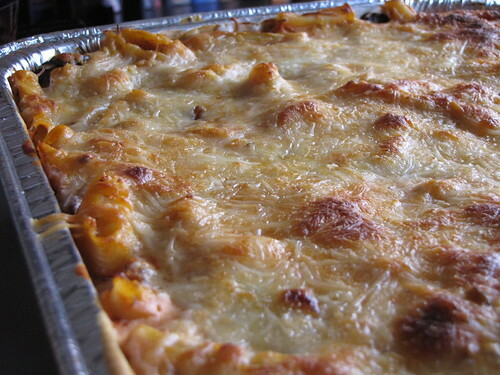 To Bake: pull the pasta from freezer the night before and let thaw. Remove foil and plastic wrap. Bake at 375 degrees for 20-30 minutes or until hot and bubbly.